What is / What are Chakras? Chakra was originally a Sanskrit word meaning ‘Wheel’ – in particular, wheel of light. These esoteric structures are energetic systems that work with the vibrations of life energy or life-force, sometimes referred to as ‘chi’, ‘prana’ or simply ‘light’. They act as a kind of transformer, translating the incoming energies into usable energy for the body. They generally have both sending – transmitting or giving – and receiving – taking or attracting – qualities. A Chakra is actually a part of the human physiology, but is not readily visible to the human eye. It has a direct correlation or co-relation with the nervous system, as the Chakras that are placed within the body (called ‘In-Body Chakras’) are placed at junctions of groups of ganglionic nerves that relay vast amounts of information to the nervous system and the brain. R Gerber documented these and his perception of their connection to the Main Chakras. There are several Chakra Systems within the human anatomy. The Major Chakra System is the best known system and is part of the ‘In-Body Chakras’ which are closely positioned near groups of ganglionic nerves. And there is also a series of Minor Chakra System that falls into this In-Body category. Besides these there are a number of other newer Chakra Systems. 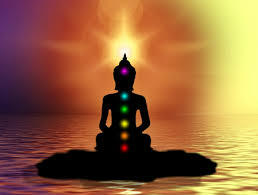 The Chakras in this system are usually seen or referred to as the 7 Chakra System. This is because it is commonly viewed as having 7 Chakras or Wheels of Light that sit within the human body. 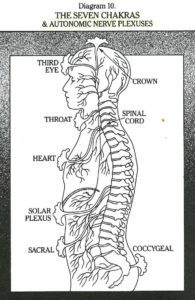 There is a central passageway that connects these Chakras together that lies close to the spine in some reference systems and in others is seen as following a pathway directly vertical down (and up) through the body. This is often referred to as the ‘Central Channel’. The Major Chakras also depend to some degree on the meridian systems. The Meridians are well documented by the Chinese in Traditional Chinese Medicine (TCM) and have been adopted by several western therapies and Natural Healing Modalities. The Meridians are connected to the organs of the body and provide the electrical network system which allows for the flow of electrical energy and information that carries vitality throughout the body. There is a flow-on effect with meridians, as they work in a sequence round the clock pretty much regulating the functioning of the body systems. When one meridian is blocked or is not flowing correctly it will usually begin to affect the healthy flow of energy to the next meridian in the function sequence . When several meridians are blocked, our energy becomes sluggish, stagnation occurs in the body, and we begin to feel the effects within the body in one way or another, depending on what is happening (or not happening). Chakra Balancing and Healing – Take Care! Each one of the Chakras fulfills a variety of roles and has specific functions. Each Chakra usually – though not always – resonates to a particular color when balanced, and needs to be performing correctly for full health in the body. Chakras that are damaged or out of balance can affect not just how we feel, but our levels of vitality and ease. ← Feel lost or overwhelmed?